Marathon season will be back again before you know it. From spectacular scenery to epic post-race parties, we've done the research so you don't have to. Just select the region you'd like to run in below and find the ideal 26.2 for you. It's never too late to make this year your best running year yet. These southern state marathons will not only offer you a late-season escape from the cold, but also your best chance to end the year with a bang. In its ninth year, Rock 'n' Roll Savannah is still as full of charm and southern hospitality as it was in year one. 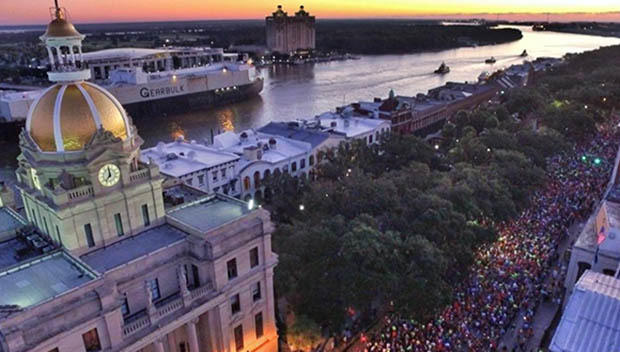 Run under the picturesque live oak trees dripping in Spanish moss, through the city's historic downtown and along the flowing Savannah River. But the fun doesn't stop once you cross the finish line. Explore all Savannah has to offer while you're there: pick up some saltwater taffy on River Street, take a historic ghost tour or even make a visit to Paula Deen's Lady and Sons restaurant for some traditional Southern cooking. This race will give you a perfect tour of the Music City, taking you through some of the most famous neighborhoods that are home to musician and artist communities. However, the highlight of the race will surely be the last quarter mile, as you make your way through the honkytonks of Broadway for a triumphant downhill finish. The race has a six-hour time limit, and energy gels and Gatorade will be provided on the course. Afterwards, check out the post-race block party downtown, complete with music, food and complimentary Shock Top beer. This interesting marathon is run through the nation's oldest military peak, the Chickamauga Battlefield, home to one of the most important—and bloodiest-—The out-and-back course starts at the original parade ground for the "Fighting Sixth" Calvary and spends the next 23 miles winding through the memorial on paved roads, all lined with different monuments and markers for runners to take in. Look out for re-enactors as you make your way to the finish and grab a commemorative medal. This certified Boston Marathon qualifier starts and finishes at the National Infantry Museum and honors the men and women fighting in the armed forces. The course runs through historic Fort Benning and along the beautiful Columbus River Walk, and is mostly flat-minus one hill-so it's a great option if you're looking for a PR. As pictured above, runners can also choose to run in honor of a fallen soldier who made the ultimate sacrifice. There's no better way to wrap up your year than with the San Antonio Rock 'n' Roll race. Run 26.2 miles on the most history-filled course the Rock 'n' Roll race series has to offer. The course tours through the Tower of the Americas, the Alamo, Mission Concepcion, the San Fernando Cathedral and more. This race isn't just a history buff's dream though. This music-filled race is also topped off with a post-race party headlined by American rhythm and blues band Vintage Trouble. Get a taste of Panama City Beach without all the crazy spring breakers. This certified Boston Marathon qualifier is almost entirely flat, setting you up for a legitimate run at attractive acronyms like BQ and PR. Run along the Florida panhandle's historic 30A highway and take in the white sand beaches and blue-green waters of the Gulf of Mexico. Plus, with the race starting and finishing at Jimmy Buffett's Margaritaville, there's no way to miss what's shaping up to be one heck of a post-race party with complimentary chicken and sausage gumbo and Land Shark draft beer. If you want a true run in the woods, this race is for you. With just a small section of pavement, most of this marathon takes place on forest roads and trails in Hillsborough River State Park, one of Florida's oldest state parks. Expect roots, mud, sand, rocks and, of course, adventure. After you finish, make sure to stop by the after-party. You'll be treated to a few, post-race buffet. Your registration also includes entry to the part, so you can stick around and enjoy a full day in the woods.